When first reading about The Magician, I immediately think about the upcoming birth of our first child. Of course we are worried about rising to the challenge of parenting but lately my husband and I are each struggling with letting 'me' go and accepting that it is about our family now. Hubby & I are both very organized - this can only help when the kid gets here! Hmm . . . I'll definitely think on this. Maybe I have more skills/talents than I give myself credit for. 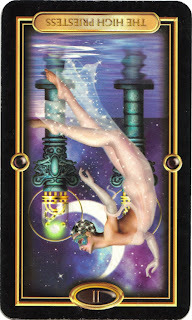 The High Priestess is a card of tuning in to your intuitive voice. In its reversed position (upside-down), it can mean a couple of things. First, (and this is what I find very interesting), a reversed card can mean to return to the previous tarot card in the deck to continue to learn the lessons there. The previous card is The Magician...which is the card we pulled for yesterday's Intuitive Tuesday. By pulling The High Priestess in its reversed position, you are being asked to again read through, meditate and discover yet another layer of what tools and gifts you may be overlooking. What you mentioned yesterday as one of your gifts is a great start, but its time to dig deeper. Jamie, you said you were very organized. From one organized person to another (I have a spreadsheet grocery list that matches the aisles in my grocery store! ), being organized comes in very handy with kids. What I believe The Magician is saying (and you alluded to it in your comment), is less tangible than that. It is something magical that both you and your husband have. More of each of you that will come out as you step into the role of parenting. These qualities may be in their infancy -- that is, they have not had the opportunity to come out -- but once you welcome this child into your life, you will find new tools that you didn't even know you had. Here are some things to think about as you dig deeper...What lies beneath the surface most of the time that others notice but may not be able to name? Perhaps it is a developing gift -- something that you are just starting to notice and develop. It might be a value that you hold that will more fully develop as you add this new aspect into your life. Look beyond the obvious to find the important. Here is where your gifts will come out and shine! Second, The High Priestess (reversed) might mean that you are not listening to intuitive messages you are receiving. It is a feeling of being out of touch. Do you find that you are looking outside of yourself or asking people around you for guidance, possibly not trusting what you know or shopping around to see what feels right to you? If you tend to doubt yourself, one of the easiest ways to practice tuning in is to pretend that you are a gifted intuitive and psychic. Imagine being SO intuitive that people seek you out for guidance. From this perspective, what guidance do you have in regards to your situation? Remember, you are VERY intuitive. What are the answers you have not been hearing? Tune in now and listen. Your High Priestess wants to give you the direction you seek. Your second interpretation of today's card speaks to me. I do have a strong feeling about my current situation but I am doubting it and continually looking for outside confirmation. And, um, can I borrow some of yours and Jamie's organizational talents? Just a little bit? I like the feeling of imagining I am highly intuitive. I really AM -- about myself. It just takes listening, which takes quieting. And I'm with Furrow. Jamie and Sheri, send some of those organizational skills this way. I like the idea of "pretending" to be intuitive. Sometimes I feel very tuned in but other times not at all. I'm going to try this for sure! In complete honesty, I have been feeling lost. In this transition between no children/infertility & loss/pregnancy I'm not sure where I fit in. In pretending to be the intuitive one, I feel so much more confidence. I see two people who are patient, brimming with love and anxious to show their child all the things they love about this world. They have a willingness to learn and aren't afraid to learn from their mistakes. And not just learn from their mistakes but also able to laugh at them. I like being the intuitive one - it is very calming. I think I'll continue to use this in the next few months!